The strangest part about a visit to Phnom Penh takes place right at the start. As you do in most South East Asian cities, the day begins by bargaining with a tuk-tuk driver over the price of a day tour. Except today we are making this driver take us out to visit sites where thousands of people were tortured and murdered. For the driver, today is just like any other day, and we are just two more tourists who he’ll drive first to the Killing Fields, where over 20,000 Cambodians were brutally murdered and buried in shallow mass graves from 1976-1979. 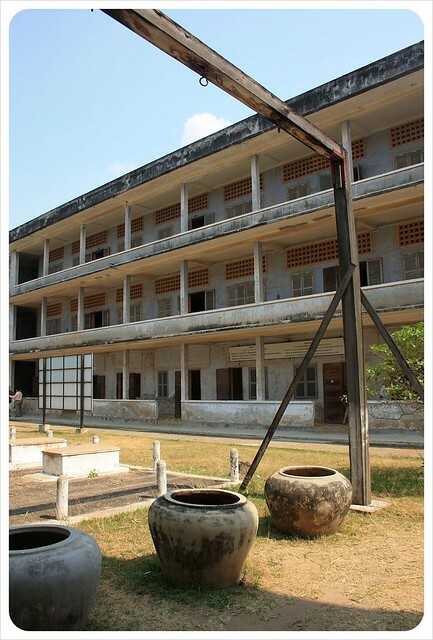 Then the tuk-tuk will sputter over to Tuol Sleng, or S-21, the school which was turned into a prison where those same Cambodians were imprisoned and brutally tortured for days, weeks, months at a time before being transported to the Killing Fields. At the end of this day, he says will also bring us to the Russian Market, a fairly large market area with tourist trinkets, which seems fine at the time. So how much are we supposed to pay for this? At first he wants $20…but we have been in Cambodia for a few weeks now and know that is far too high. Without much effort, we get him down to $10. While we don’t exactly feel comfortable bargaining down, what comes next truly disturbs us. In order to make an extra $5 our driver attempts to offer an extra element to the day: he wants us to start off the day with a visit to a shooting range. Do we want to go to a shooting range? Apparently, the shooting range is one of the ten or so main options offered by all tuk-tuk drivers in Phnom Penh. We are about to go learn about the mass murder of over two million innocent Cambodians. We have a heavy feeling of dread, fear, and sadness about what we are about to go do, and we haven’t even gotten there yet. What kind of person would want to shoot things up after a day like we were about to have (it turns out, plenty of people do). We politely and incredulously decline, and off we go to the Killing Fields. Roughly 45 years old, the driver would have been a child during the time the Khmer Rouge were in power. He has most likely lost dozens of family members and friends, and now spends every day taking tourists out to where some of the most heinous crimes were committed. Needless to say, we definitely feel uncomfortable thinking about that for too long. We are not the first to arrive here, and at first I cringe at the bus loads of well-fed tourists mulling about with their headsets on. They are listening to an audio-tour, no different than a day out at an art museum and the contrast to the starvation and suffering on these grounds 30 years ago was too much to handle for me. But within a few minutes of listening in, I realize how important it is for people to come here and learn about the genocide unleashed on Cambodia by Pol Pot and the Khmer Rouge. In school, we learn about Nazi Germany under the pretext that genocide must never happen again, yet no mention was made of Cambodia, where the Khmer Rouge killed anyone who was educated or spoke foreign languages, while others were forced to work in labor camps. 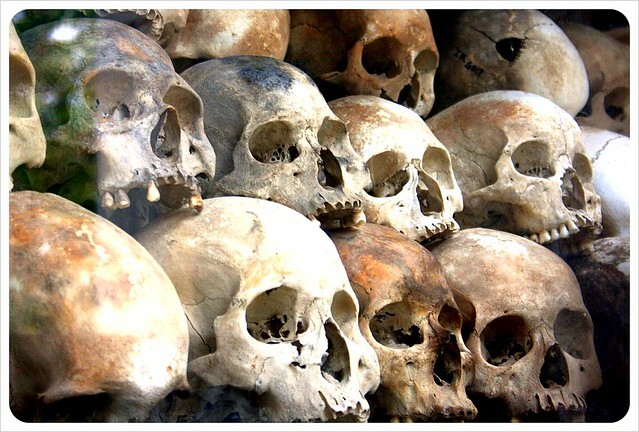 Over 25% of the population, or 2 million people, were killed from 1975-1979, in order to create the all-agrarian society Pol Pot believed was necessary in order to free Cambodia and make it independent of outside influence. There are moments here that I will never forget. Visualizing how the ground bubbled up as gasses from the 20,000 buried bodies were released. Seeing the clothes that had rotted off the victims still scattered on the ground, partially exposed by wind and rain. Standing in front of the Killing Tree, against which Khmer Rouge soldiers bashed babies and their mothers like sacks of potatoes until they died; the price of bullets too precious to waste. Stop 18, the last stop on the walking tour, brings you to the massive pagoda, the center point of what is now a memorial park. Over 9,000 skulls are piled inside this 17-storey structure, along with bones and more piles of clothing. Witnessing this makes the scale of the killing truly tangible. As at other points of the tour, I am immediately sick; nausea mixes with a piercing pain in my temples and an angry fire in my heart and my stomach too hard to explain. We learn at our next stop, the Tuol Sleng Genocide Museum, that of the 20,000 people who were tortured at this former prison, only seven people survived. Around the country there was a much higher rate of survival, but here at S-21, just stepping through the doors meant sentencing to months of torture before eventual death. Before we stepped through the doors, however, we were confronted by a legless blind man begging for money outside. I decide he is, no doubt, a victim of the regime, who now spends his days outside one of the darkest locations in Cambodia’s history. Passing through the doors, thousands of fearful eyes stare back at us, in the form of black and white photographs. Head shots of every single man, woman and child brought to this detention center were taken, methodically documented their arrival. I stare at photograph after photograph choking back tears, knowing that if I let one fall, I won’t be able to stop. The hardest moment came at the end, when we were just about to leave. One of the seven survivors was sitting at a table in front of the prison, signing copies of his tale of survival. There was a part in both of us that wanted to run to him, grab his hand, cry with him, buy his book, but something held us both back. The thought of returning, every day, to the place where I was hung from poles by my ankles, with my face hanging in a bucket of water (or worse), electrocuted, cut, beaten and forced to live on rice water for months at a time…this was too shocking. We walk out with the heaviest of hearts, and limply agree to stop at the Russian Market as planned, though at this point I may have paid him double just to go back to the hotel. We wander through the tourist trinkets and buy a coconut, but don’t last more than twenty minutes at the market. A thought hits me on the ride back…maybe my tuk-tuk driver wasn’t a victim…what if he was a child soldier? What if that beggar out in front of S-21 was, too? In fact, how many people in the Russian Market, selling t-shirts, headphones or perfumes were Khmer Rouge soldiers and how many were victims? Anyone between the age of 40-60 must have been involved one way or the other. There has been hardly any accountability for what happened in the years from 1975-1979. So little, in fact, that Pol Pot himself died safely and peacefully in exile in Thailand in 1998, never brought to trial for his sins. And today, in 2012, the UN tribunal trying the highest Khmer Rouge leaders is still making headlines. 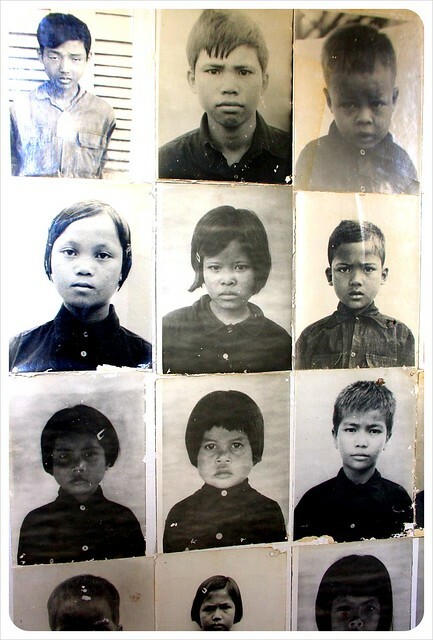 If you are interested in finding out more about the Khmer Rouge, please read First They Killed My Father , the autobiography of Luong Ung, a Cambodian woman who was just five years old when her family and thousands of others were evacuated from Phnom Penh in 1975. Her incredible story of survival takes you on her journey, from near starvation in a labor camp to becoming an orphan to time as a child soldier and on to her new life in the United States. Her second book, Lucky Child, tells the heartwarming story of the family’s reunion in Cambodia, a country that continues to heal. You can travel to Phnom Penh from Thailand by bus (about 12 hours from Bangkok) or take a cheap flight from Bangkok. If you are coming from Siem Reap, you can either fly or take a bus (5 – 6 hours). Jess, I have a lot of respect for you and Dani touring the genocide museum. Karen and I simply couldn’t do it. Our guide and driver both seemed a little relieved we didn’t want to see the Killing Fields. I’m not sure I could have coped with it as well as you did; seeing the land mine victims selling their tour books and playing their folk music was enough to bear. Oh wow, thanks Laura, that’s so nice of you to say. I could have continued on in the post, but it was too long already, about how the sadness continues on the streets with the landmine victims (did you go to the landmine museum?!) and children selling the books…yet Cambodia was still one of our favorite South East Asian countries #justsayin! 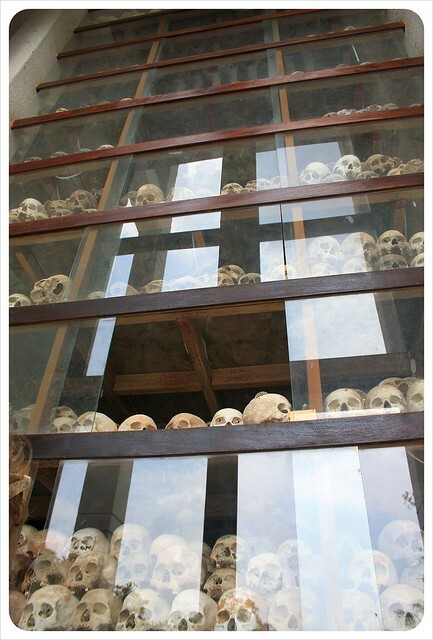 No matter how many times I read about the killing fields, it still sends chills down my spine…. Wow. Such a moving read. I can’t imagine how it must have felt to be there. Beautiful post and I really want to go there myself. God, this is awful. Thanks for the insight. My friend was talking about the Killing Fields last week and I couldn’t believe I’d never heard of them. I’m going to check out those books. My knowledge of the history of Cambodia is shameful. Vicky – that’s exactly how we felt. We started becoming really aware of it when we bought the guide book to South East Asia, planning our trip out. I had maybe heard of the Khmer Rouge, maybe the words Pol Pot. But why don’t we learn about this? We learn about Nazi Germany/Europe, but only because we were involved. But this is 25% of the entire population…and just so much more recently, and yet we don’t learn about it. You should pick up the books – they are so well written, and you feel so involved in the story. Cambodia is the only country we’ve been in SE Asia and we also loved it and talk about returning. The people are working their asses off to leave behind the legacy of the Killing Fields and create a new Cambodia. I admire them. The poverty was a little overwhelming at first as was the trash. But I think this will be a good warm up for what Karen and I will see in India later this year. Very moving post on such a horrible part of world history. I still don’t understand how the world allowed this to happen? Like many things that happened years ago or today… I just can’t understand. The feeling though you get when bargaining or asking prices for tours of horrible things that are happening or have happened in our world is like no other. You just can’t explain it… a part of you can’t even believe you are talking about paying to see these things. I still have goose bumps from reading this. I too have heard about Pol Pot and the Killing Fields but didn’t really “know” too much. This was very enlightening! Thanks for sharing with the world, who needs to know about this. 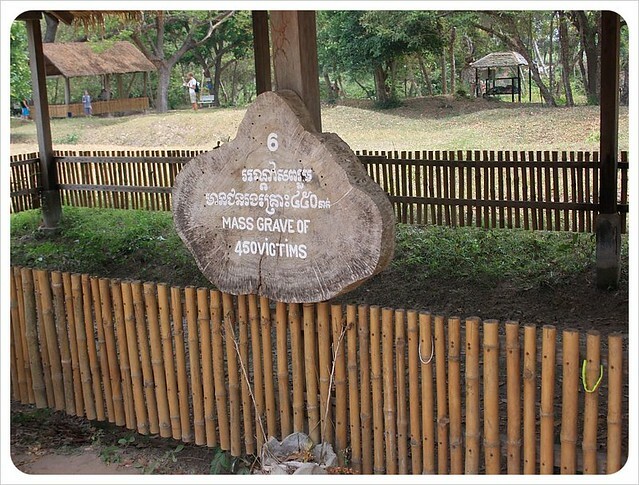 The Killing Fields are an important part of history that is over-looked way to often. I understand the view you are trying to share, your experience and bring light to this horrible history. However I lost empathy for you and your story when you had to cast other tourists in such an unfortunate light. Those “big, fat, white tourists” are no different then you and me. You seem to have used all your empathy and caring for everyone but them. Try to extend your circle of compassion a little farther to fellow tourists like yourself. I will step down off my soap box and say I love your blog and will continue to be a loyal reader. Krista – thanks so much for your comment, and your constructive criticism of that part of the piece. You were absolutely right, and it was just a lazy description on my part. I’ve changed it now, and tried to highlight more of what I meant to say. I think what I was feeling, by being one of those big, fat, white tourists, is that guilt I am trying to express. I wasn’t born yet, but even now, people I love at home would never fear that, for their education or language skills, they would be captured, tortured and murdered. And yet seeing them all gathered there, in *that* place, it was a contrast that was hard for me to take in. Hope it is more clear now both here and in the piece. Thanks again for saying what you think! 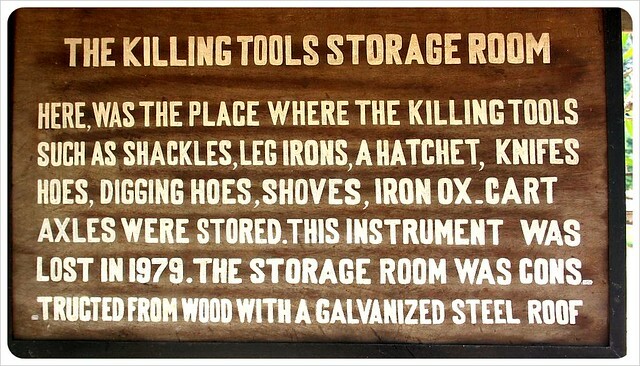 I can’t even imagine visiting this place. I would fall apart. However, I think visiting these places is a must and a duty of a traveler. You have to do it when you’re there. I didn’t think I could do it, but I did it…it affected me so deeply, too! Thanks for sharing this book! We haven’t read it, but it sounds like the perspective is fascinating!! I’m still on a bit of overload from the other two books, but I think we will definitely read this one soon! It is indeed a very sad place to visit, but I almost felt like I owed it to the Cambodians to visit to truly understand their tragic history. The killing fields were a hard place to visit, but I really couldn’t compose myself anymore when I went to Tuol Sleng. It made me so angry, that nothing was done by the outside world. Working in an NGO here in Phnom Penh and being able to visit people in the provinces really showed me the devastating effects even 40 years after the events. I encourage everybody to visit these places, so that our generation learns never to stand still through an event like this ever again. Tammy, we feel the same way. More and more people need to know about this, and Tuol Sleng makes it so personal to you that you can’t just block it out. You’re looking into their eyes, you’re physically standing in the place of all this pain and suffering. So many people block out news of genocide, but I think once you’ve actually been to a place like this, you can no longer block it out. One major lesson I took from this is just how significant education is, both to maintain democracy but also in terms of prevention, like you say. Just reading this article sent chills down my spine. I don’t think I can be able to visit that site. That is indeed a horrible part of world history. That is probably the most powerful and moving post I have ever read! Wow. Thanks so much for sharing it. Can’t believe what they went through at the hands of other humans. So sad. Great write up! I plan to go next week with my 13 year old son. We know what to expect but also know emotion may over come us. I think getting to know these kind and wonderfully resilient people already will make it that much harder to know what they have endured. I am reading Pol Pot right now and it is totally fascinating and sickening. The history of Cambodia both before him and after him were also quite painful to read. The US involvement in it all makes me feel embarrassed to my core! I found tuel slung so upsetting, but I didn’t visit the killing fields. There are so many first person accounts written in books that you can buy there, and some of them made me really emotional… what an aweful history. I agree that this is something we don’t learn enough about in Western countries. In fact, many people I’ve talked to have never even HEARD of the killing fields. I can’t imagine how hard it must be to visit, knowing a bit about it. I probably would have been bawling my eyes out. Thanks Amanda, so glad you agree. It’s one of those things where we are so glad to travel to learn all of this but it was so heartbreaking to actually experience. I share your feelings of being torn when seeing the well fed tourists. However, like you, I’m glad they are there to see the horrors that have occurred in our lifetimes. It’s important for all of us to see what people and governments are capable of. You are absolutely right, Mary – it is good to see that people learn about these horrible things that are not very well known in the rest of the world. 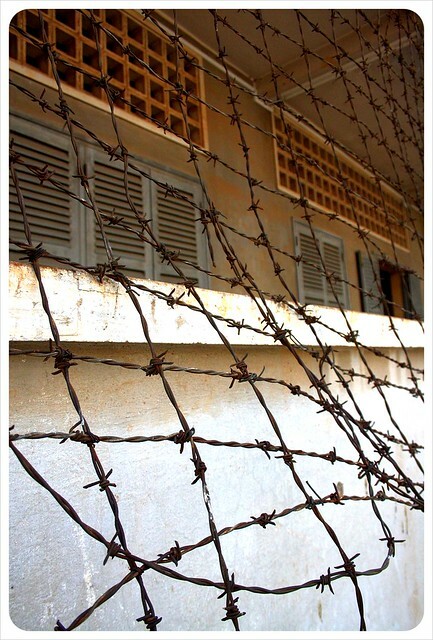 When we arrived in Cambodia we only knew roughly what had happened under the Khmer Rouge, but we learned so much more when we traveled through the country and visited all these places like the Killing Fields, Killing Caves and the Tuol Sleng prison.